Water gushes past the sinkhole on Monday in the main spillway that prompted officials to activate the emergency spillway, at the top of the dirt hill face on the left. That didn’t happen, and hasn’t happened yet—but the evacuation order remains in effect as engineers frantically drain off the top of the lake before storms expected this week. 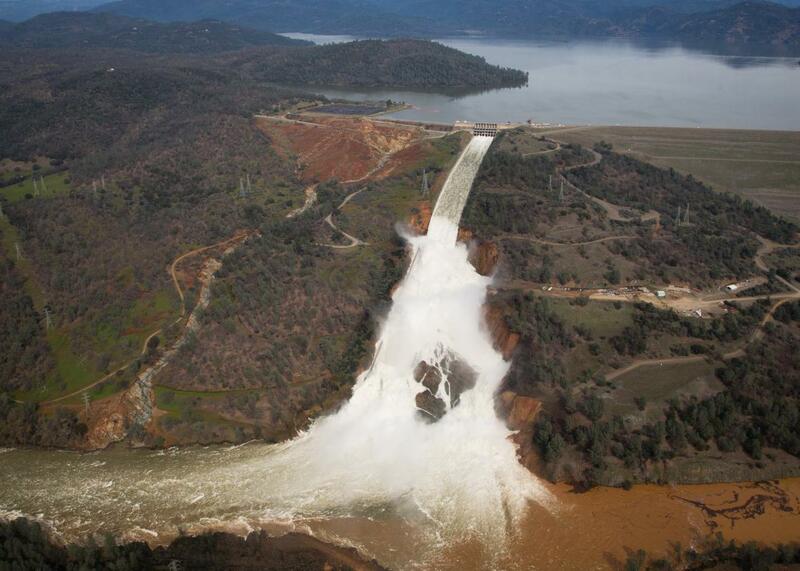 How did America’s tallest dam veer toward a crisis? It’s easy enough for a nonengineer to understand: Last week, dam workers discovered an enormous gash in the main spillway, the long concrete chute that lets excess water out from the top of the lake. In an effort to contain the damage, they slowed the outflow from the main spillway, letting the lake rise. The emergency spillway—a concrete wall over an earthen hillside—would be activated for the first time, easing pressure on the dam without worsening the sinkhole below the main spillway. And then, barely a day after the lake started to flow over the emergency spillway wall, the evacuation was ordered. A hole had been discovered in the hillside below the wall, eroding quickly in the direction of the lake. If the wall gave way, an uncontrolled, 30-foot wall of water would be unleashed on the hillside and the towns below. Immediately, the damaged main spillway was pushed to let out as much water as possible, as work crews with dump trucks and helicopters work to fill the hole beneath the emergency spillway wall with boulders, to prevent further damage. The larger question is why engineers were sure that letting 450,000 cubic feet per second of water flow down an earthen hillside would not cause damaging erosion. (That was what the emergency spillway was built for—in reality, a far smaller quantity of water surged over the lip and down the hillside.) In 2005, environmental groups argued this exact situation might occur, and urged the Federal Energy Regulatory Commission to force the state to “armor” the hillside with concrete or other reinforcements. That didn’t happen. Ron Stork, the policy director of Friends of the River, an environmental group that brought the original complaint, told the San Jose Mercury News that he was told that contractors (the entities that buy water from the massive State Water Project, of which Lake Oroville is the keystone) did not want to pay for the improvements. Jeffrey Kightlinger, the general manager of the Metropolitan Water District of Southern California, the water utility for Los Angeles and its environs, said the issue was not cost but federal guidelines, the Los Angeles Times reported. In those guidelines, he said Monday, “they talk about how you don’t put a lot of funding and concrete, etc. into emergency spillways because presumably they will rarely if ever be used.” That rare moment, it turns out, would’ve been right now. It all adds up to a fable for whatever political framework critics would like to apply: regulatory negligence (why wasn’t erosion potential recognized earlier? ), utilities with perverse incentives (did price-sensitive contractors have undue influence over a safety decision? ), even California liberalism (“California spent on rail and illegals, but not on damaged dam”). *Correction, Feb. 14, 2017: This article originally referred to the Oroville Dam’s spillway as a concrete wall. The spillway also consists of a chute below the concrete wall.